Victor Anselm is my current player character from our evil pathfinder campaign that my friend is running. Blanca's character Renata is in the same campaign - it's based around an assassin's guild (of which we're members) situated in the seedy streets of a (largely corrupt) city. Blanca's comparison to games like Dishonored is pretty accurate - we play assassins tasked with offing whichever individuals the guild is currently being paid to off. We've had around six or seven sessions now, and it's been quite fun! Each session takes the form of a self-contained "hit" and they've all been pretty varied in terms of structure and method. It's a moderately high-level campaign for us - at this point Victor is a 6th-level Wizard with three levels in the Assassin prestige class (which is pretty much the same as its equivalent in 3.5). 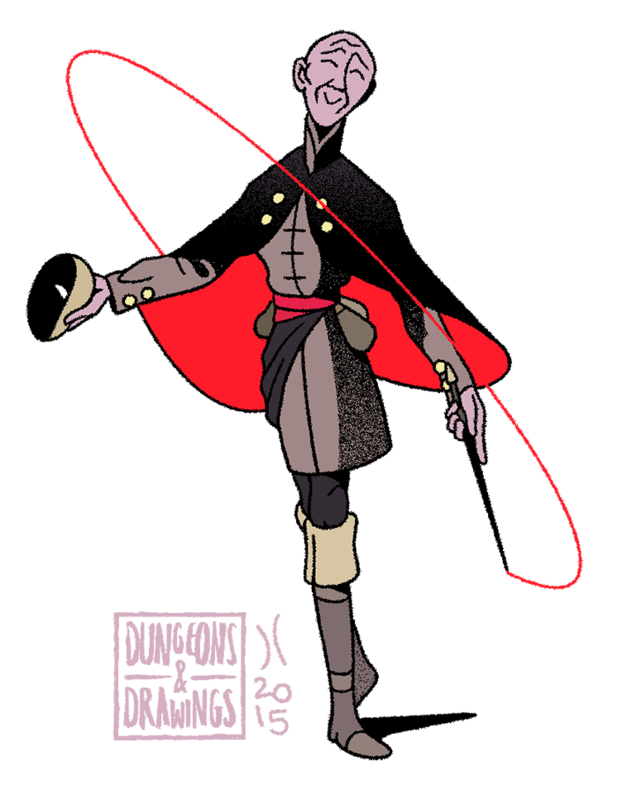 He's pretty fun - all his spells are themed around blood and vampirism, although he's not actually a vampire. He's more just supposed to be this person who seeks knowledge and power, both at the expense of his own health and of the people around him. He's supposed to have a bit of a Hannibal vibe, where he appears quite friendly but you always have this slight sense that he's orchestrating some elaborate death for you! The campaign has been pretty wacky. After our (failed) first hit, we learned that banking your whole mission on a single d20 roll - whilst potentially very cool - can go pretty horribly wrong. As a result we've settled into a bit of a rhythm of coming up with methods that trade stealth for reliability. One memorable example was handing a letter covered in around 5 instances of Explosive Runes to a lady at a ball. Immediately afterwards we all run away, Wile-E.-Coyote-style, crouching behind a table and plugging our ears as the letter explodes, dealing something like 30d6 points of force damage to everyone within a 10-foot radius. There is a line where "assassination" crosses over into "terrorist act" and I think we are currently dancing an awful, awful dance along that line. It's fun though! There's definitely a part of me that misses playing a Good Guy in an Epic Fantasy Story but I think messing around with what works within the context of tabletop RPGs is always worthwhile. 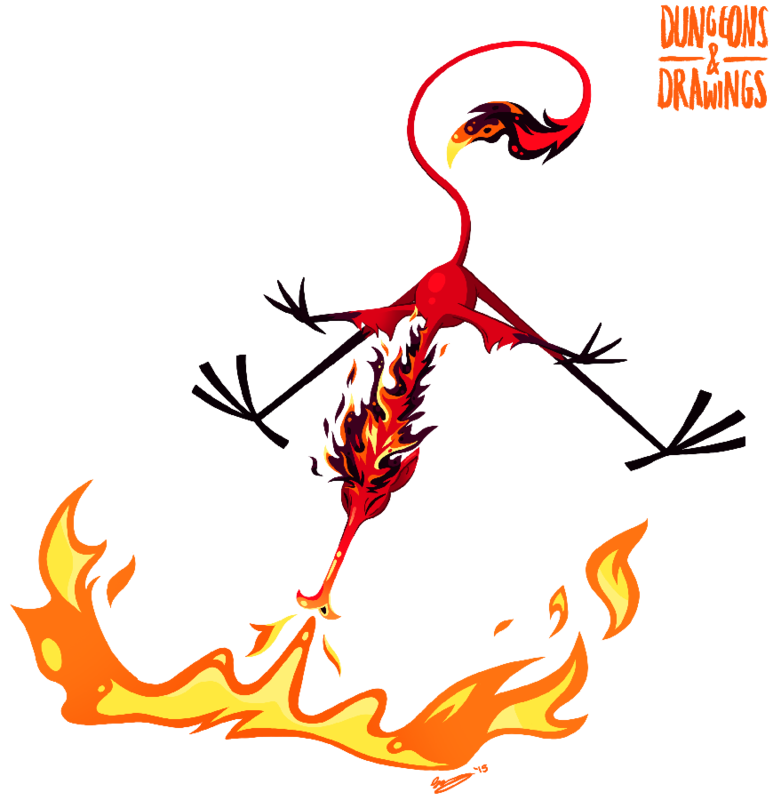 So while Fire Elementals are already a pretty dangerous and unpredictable bunch, as pure elementals, their attitude towards others is generally fairly neutral. Sure, they'll feel the compulsion to burn things, but it's not because they're especially mean or whatever. Harginns are especially mean or whatever. They like burning living things. It's fun, you know. Grues are elementals born out of sections of their Planes which have been touched by evil magic. Because of this, they're especially nasty, territorial, sadistic, though fortunately they're on the weaker side of the spectrum. However, grues are especially sought after by wizards because the combination of elemental and evil magic crystallizes as a small magical object in the core of each elemental, which remains even after the grue is slain. This object can then be studied to gain new spell knowledge. So as far as I know, grues originate from Zork, a 70s text-based videogame. I played it once. It's quite difficult. Grues are creatures that lived in the darkness and it was inadvisable to wander out there. It is pitch black. You may be eaten by a grue. There was no physical description attached to the grue, since no one has ever survived an encounter. But I always pictured them looking like cranes (grue sounds like grúa which is Spanish for crane, both the bird and the machine), which isn't very scary. Somehow it made it more intimidating, the idea of this gangly beaky thing being able to devour you though. 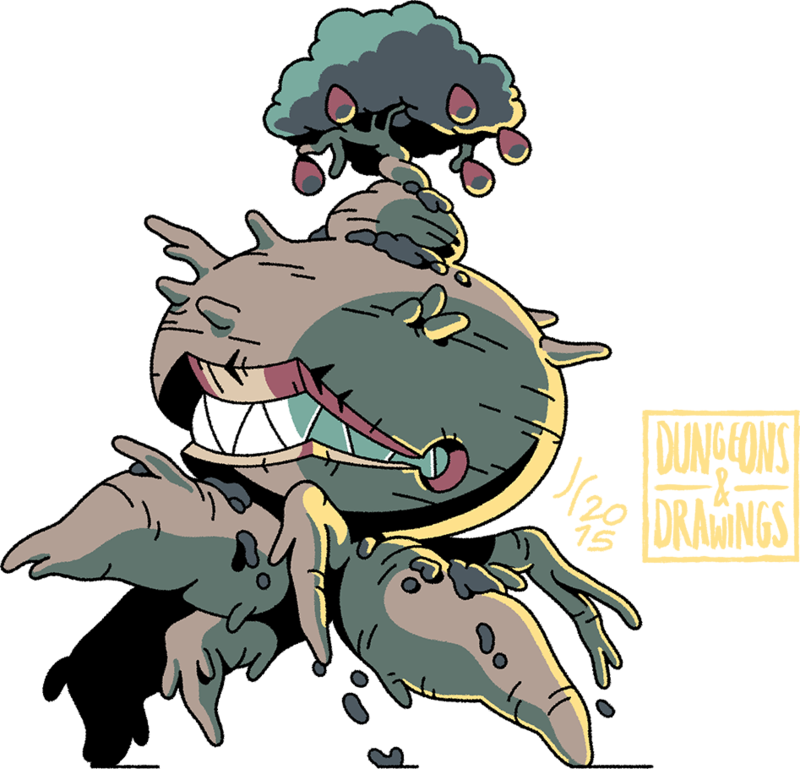 Treants are large plant-creatures that grow and shepherd plants and trees of the more mundane varieties. Tree-like themselves in appearance, they are often easily mistakable for the foliage they ward. The treant combines the stoic toughness of ancient plant-life with the monstrous strength of large animals, resulting in a curious hybrid of tree and beast. Although typically slow and ponderous, if a treant's herd is threatened they are easily angered - and an angered treant is truly a sight to behold. Treants are fun as a concept because of the fact that they mix traits from two of the most fundamentally differing lineages of life imaginable. It's fun to think about how the world would look if human, or even animal, intelligence had been achieved by some other branch of evolution. Tree-men classically play off the idea that forests can be some pretty eerie places, especially given the odd shapes that you find trees contorting into (see Mandragora plants for some good examples). I based the swole body of this guy off the famous baobab trees of vaious places in Africa, although the body has all these little rooty growths coming off of it that are supposed to look like those little shoots potatoes grow. I also decided to go with making it overall less human-shaped and more like a big scuttling spider-thing. Blanca reckons it's a bit far from the traditional tolkienesque treant but I'm quite fond of it! Brixashulty are a specific breed of large goats kept by halflings for their milk, wool and to be used as riding beasts. They also make excellent guard animals, as they're incredibly distrustful of strangers, are armored by thick fur and have powerful butting attacks. 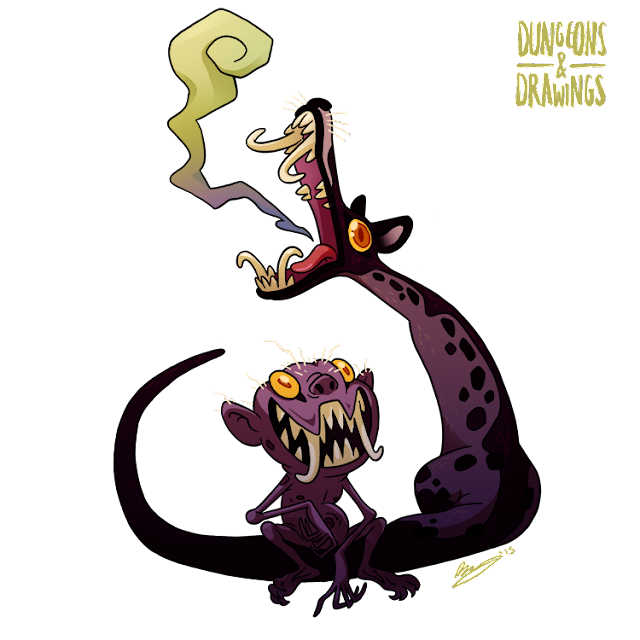 The Brixashulty is a completely non-magical animal. It's essentially just a goat with a weird name, an alternate mount for Small PCs who don't want to have a riding dog or pony. 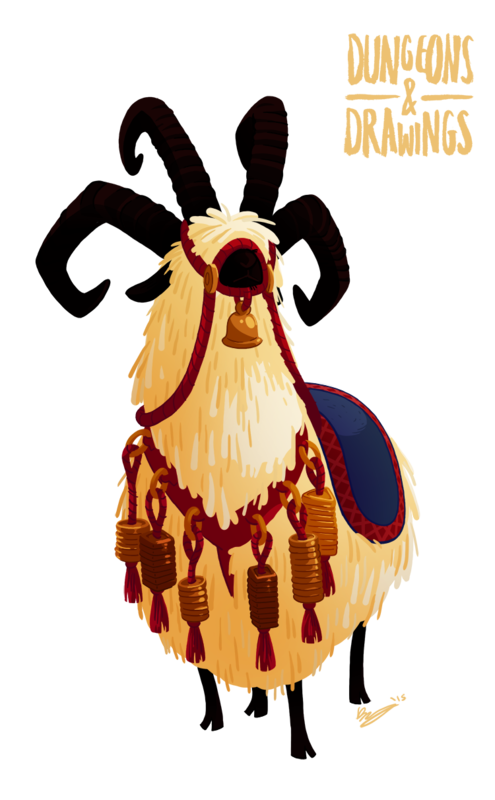 I haven't found any stats in the official books for goat or sheep (though there are goat-based monsters), so you could probably use this for a vaguely ornery but ordinary goat. Sheep/goat mounts are pretty common in fantasy tropes for the smaller races, dwarves, halflings and the like. It's the basic mount for dwarves in World of Warcraft and the Kithkin ride them in Magic: The Gathering (technically they're springjacks, some kind of goat-bunny hybrid stats plz). It makes sense, with goats being associated with pastoral or rugged environments, which the smaller races are associated with. Of course, nobody rides goats for real, though there are the occasional novelties for children and apparently they make decent pack animals.